For fans of Soul Eater and many after us, there will be a good chance we might not have heard this OP. 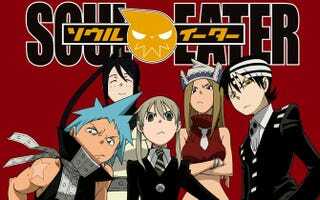 Soul Eater got a repeat airing and they animated new openings and endings for it! That’s the only difference. I know I missed this first time and I hope to bring this to everyone’s attentions so we all get to listen to a gem of a song. Just the song, it is harrowingly catchy and beautiful. I might be pushed to write more but really I can’t stress enough that for me, this song hits all the right buttons. The beat is good; the voice is honey in my ears and the right amount of pop to be appropriate for all occasions! What about the animation? Well everything we see just mirrors the lyrics of the song. Not much to say really, it’s got cleaner animation which is very pleasing to the eye. It all matches to the beat of the song with screen transitions keeping the flow of the song in the opening segment which is good to keep us interested. Hit that chorus and I do feel like I’m flying through the sky listening to the artist hit the higher notes. Wind down with the nice strumming of the guitar accompanied by a zoom out of the academy with the older characters standing in front. Yup I like this opening. It’s just really really good.